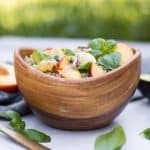 Avocado Ranch Tuna Salad. 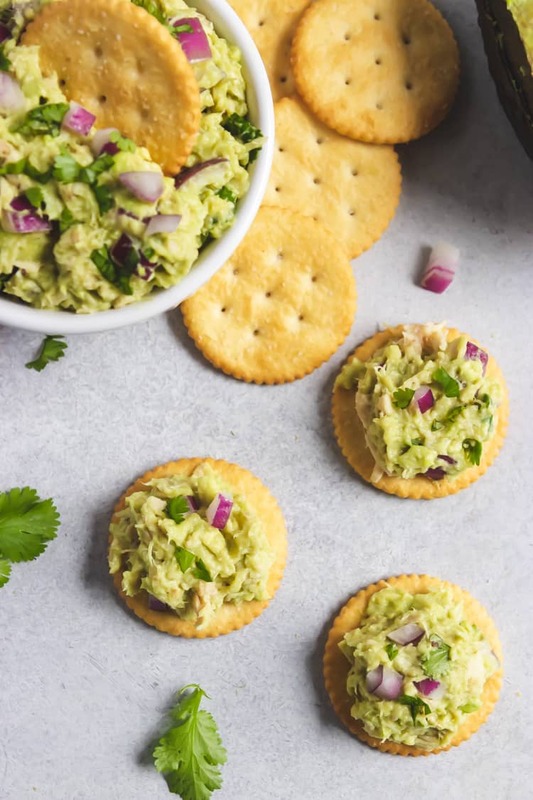 Skip the boring tuna salad and make this tuna salad packed with fresh cilantro, avocado and ranch. Tuna will never be the same again! This is a REALLY big week in more ways than one. It started out with a huge celebration today: Sam’s Baptism. He was so handsome, and did so well through the entire thing. Not a single tear shed! And then he slept through most of the party afterward, but it’s not like he got to enjoy all of the food while everyone else did, so maybe it all worked out for the best. But this week, that ALL changes. This week, we start our big little man on solid foods. And trust me, the way he stares at everything we put in our mouths, he is so ready. The thought of starting our baby on solid food has actually stirred up a lot in me, which makes a lot of sense. Since I struggled so long with my own relationship with food, it is so important to me that I do everything in my power to help nurture a healthy relationship with food for Sam. It’s important to me that I live and model what I want Sam to learn as he starts to explore food. If Sam sees me counting or calculating every morsel that goes into my mouth, then what does he learn? Not to eat intuitively by any means. If he notices that mommy is always eating something different from him, or the rest of the family, then what am I teaching him? If I talk about feeling guilty about what I have eaten, then he will learn that food is either good or bad. He will connect food with a moral code. And I do not want that for my child. The thing is, I had great models growing up when it came to food, and yet I still struggled. There are plenty of other impacts on our relationship with food, BUT, whatever I can do to make our home a positive place to taste, explore, enjoy, nourish, and so much more, I will do. The things we do, the things we say, our children notice and internalize. Your little girl may notice how often you weigh yourself and the frustration that may show on your face when the number is not what you want it to be. Your son notices when you nibble on a salad and everyone else enjoys the pizza ordered from your favorite restaurant. A frown in front of the mirror, saying you shouldn’t have eaten this or that, or saying you ate “bad”–all of that, they take in. They internalize. And some move on just fine through life, while others carry it with them and take note, and see the world through those eyes. So this week, I will embark on a brand new journey with our son, and I will do my very best to make sure I can nurture a positive relationship with food and all that surrounds it. Whatever I can do in our home to make sure he never sees food the way I once did, I will. I eat tuna salad probably 2-3 times a week. Anthony hates it so now that I am home during the days with our nugget, I typically whip some up for lunch. It’s quick and easy and always fills me up, so it definitely works for me. A lot of times I make some form of my Avocado Dill Tuna Salad, or sometimes I just put some mayo and spices, but needless to say, there is typically an avocado in my tuna. 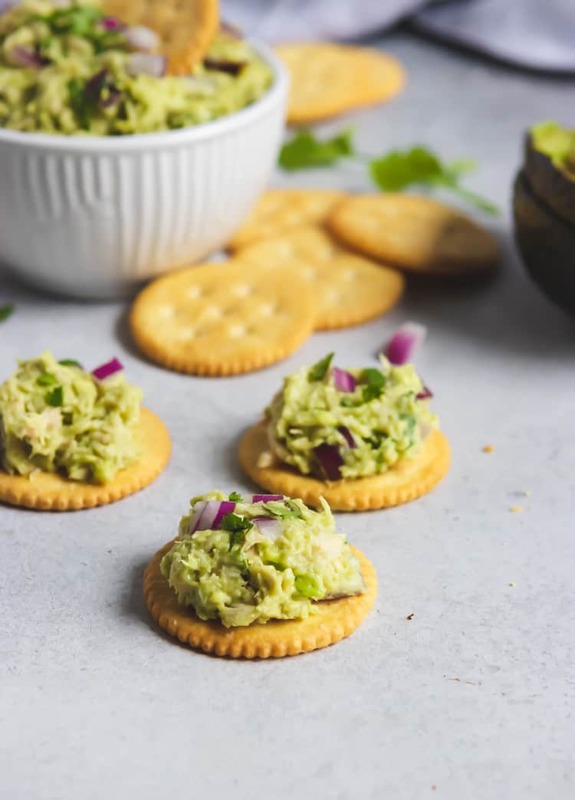 I also have a not-so-tuna salad for my vegetarian friends–I have made this Vegan Chickpea “Tuna” Salad for several parties and get rave reviews from even my biggest meat eaters. Serve it up on crackers and everyone’s happy! Recently I got a little bored with the same old, same old, so I branched out a little. I went with my typical avocado but added just the right amount of ranch and a big bunch of cilantro. Wow. Game changer. I have never added cilantro to tuna salad, but I am not sure I ever want it agian without it. If you saw how much I put in my guacamole you would get it. As far as ranch dressing goes, pick your favorite. If you need to go dairy free, that’s fine, I know there are quite a few out there now that are delicious. Enjoy your tuna on toast, as a sandwich or by the forkful. I also love dipping pretzels in mine. Whatever way you like it, enjoy! Remove seeds and scoop avocado into a medium bowl and mash. Add in ranch, onion, cilantro, lemon juice and spices and mix well. If you prefer a touch more of garlic (depends on how strong the garlic tastes in your ranch dressing) add that as well. Chill for about 15 minutes before serving. Store in refrigerator in airtight container for 2-3 days. 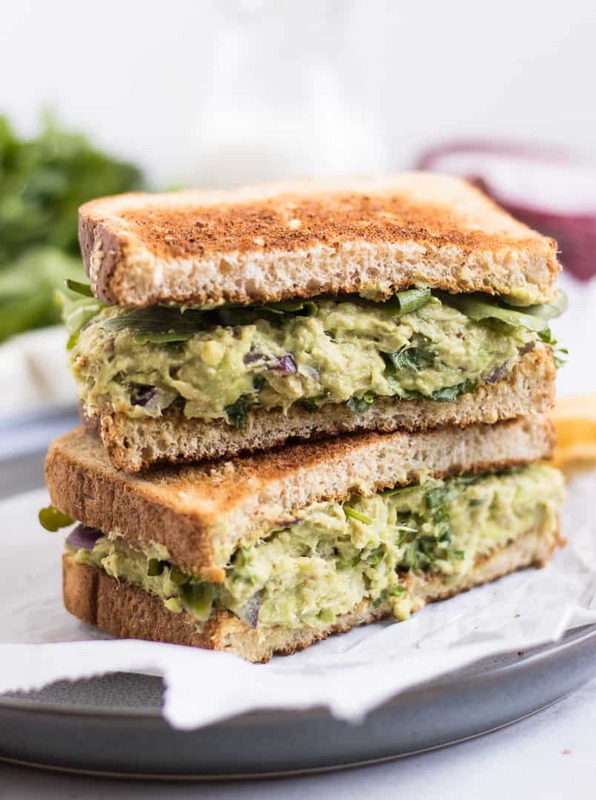 I’m not a huge fan of avocado but this looks delicious and I love Tuna Salad Sandwiches. I’m definitely going to have to give this recipe a try. Thanks for sharing! Can’t wait to try this! 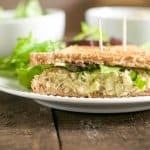 My sweetie hates mayo but loves tuna… this sounds like a delicious alternative! Yea, the avocado changes everything! Putting avocado on anything always makes it taste better in my book of food. Hubby loves tuna so whites would be a winner at our house. ONG! Mouth watering! Can’t wait to try it! Thanx a lot! You bet! Hope you love it Devi! This sounds super good! I’m going to have to try it out! Hope you love it, Erin! Exactly, my favorite kind of lunch! So sorry that you had a difficult relationship with food. The best of luck on this new food journey with your son! As for the recipe: yum! I love avocado and if I could I would put cilantro in everything, haha. I love seeing new tune recipes! I will be trying this I love that Mayo is not used in this recipe and I can not wait to try it out. This sandwich looks so amazing!!! 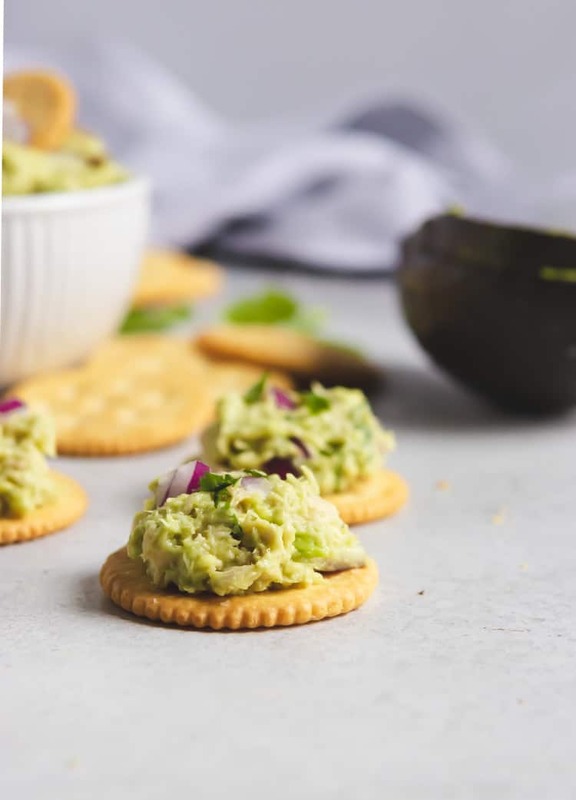 I don’t think I have ever mixed avocado and tuna together, but it totally makes sense. And they are two of my favorite foods!!! Thanks for the recipe! Seriously Jennifer, it’s a game changer! This recipe looks so yummy! I would have never thought to combine avocado and tuna in that way. Brilliant! It’s a game changer Hillary! Thanks! Thanks Albert!!! And yes, the avocado is a game changer. I love tuna and avocado so much!! I usually eat something very similar to this (less the ranch and bread) on crackers. But your version sounds delicious! I believe I will be giving this a try sometime this week! Yes, crackers are a win. I love pretzels to dip as well. Oh wow this sounds so good! 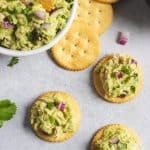 And with the avocado and ranch, I might be able to get my kids to eat some tuna for once! Oh that is a big deal! Thanks so very much Lucy!